A Pakistani activist who dances in defiance of the Taliban has choreographed a new work in the UK which tackles the issue of so-called “honour killings”. Twelve, directed by Janet Steel for the Kali Theatre Company (an organisation that showcases plays by South Asian women), is a response to a shocking statistic: every year, 12 women in the UK are murdered by relatives who believe the victim has brought shame or dishonour on their family. It consists of a dozen monologues, by 12 writers, based on the stories of women such as 17-year-old Shafilea Ahmed, from Warrington, Cheshire, who was killed by her parents in 2003 after rejecting an arranged marriage proposal. Another inspiration was Samaira Nazir, from Southall, west London, who was murdered by her brother and cousin in 2005 for falling in love with someone of whom they did not approve. 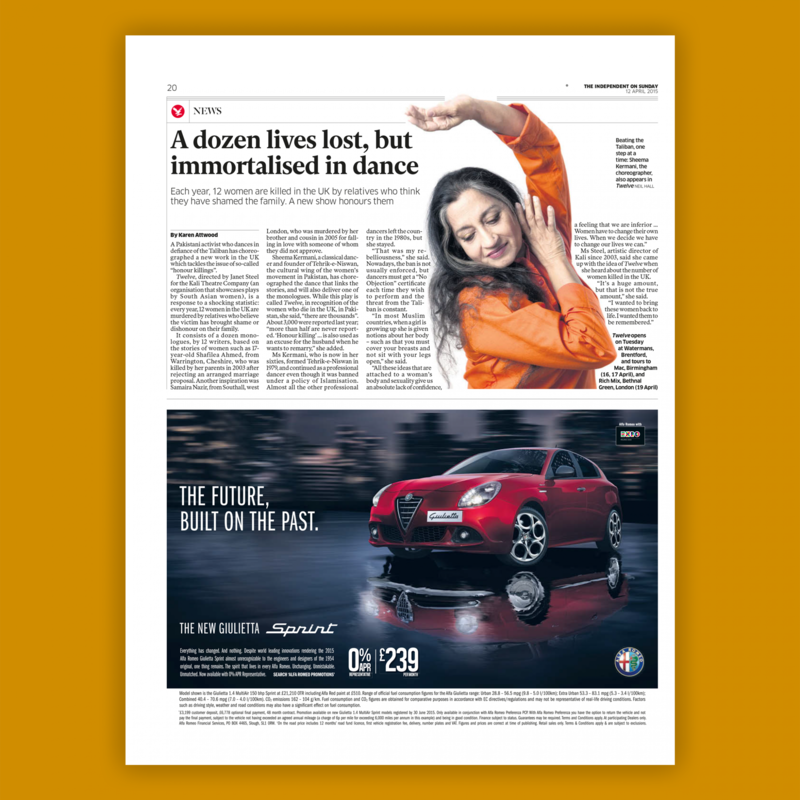 Sheema Kermani, a classical dancer and founder of Tehrik-e-Niswan, the cultural wing of the women’s movement in Pakistan, has choreographed the dance that links the stories, and will also deliver one of the monologues. While this play is called Twelve, in recognition of the women who die in the UK, in Pakistan, she said, “there are thousands”. About 3,000 were reported last year; “more than half are never reported. ‘Honour killing’… is also used as an excuse for the husband when he wants to remarry,” she added. Ms Kermani, who is now in her sixties, formed Tehrik-e-Niswan in 1979, and continued as a professional dancer even though it was banned under a policy of Islamisation. Almost all the other professional dancers left the country in the 1980s, but she stayed. “That was my rebelliousness,” she said. Nowadays, the ban is not usually enforced, but dancers must get a “No Objection” certificate each time they wish to perform and the threat from the Taliban is constant. “In most Muslim countries, when a girl is growing up she is given notions about her body – such as that you must cover your breasts and not sit with your legs open,” she said. Ms Steel, artistic director of Kali since 2003, said she came up with the idea of Twelve when she heard about the number of women killed in the UK. “It’s a huge amount, but that is not the true amount,” she said.